The lady fern grows abundantly in the woods around our house. Its delicate shape and airy silhouette resembles, to me, fine lace. 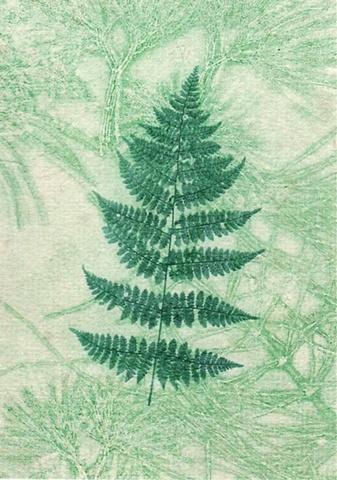 To make this print, I printed a solar plate etching of this common fern on handmade gampi paper background that had been previously patterned with inked plant materials. The thin gampi paper was pasted onto a heavier cotton rag paper.